This brief is part of a series examining inpatient hospitalizations for patients whose reason for admission was opioid overdose. 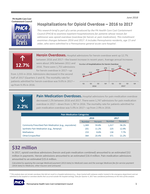 This installment shows changes between 2016 and 2017 and includes the number of hospital admissions for heroin and pain medication overdose, age and payer breakdowns, as well as in-hospital mortality rates. Population-based rates by county are also shown.